From the age of 6 you were hooked. Something draws you back out into woods each year when it’s deer season, dove season or time to pull out your little wooden gobbler. Chances are your father or grandfather first introduced you to the sport. The two of you wore matching camouflage, strong work boots, thick gloves, or maybe even a bright orange vest. You wanted to grow up to be just like him. You carried what you learned up into adulthood, how to track, how to site, what to wear for every season. But what you or your father may not have worn was ear protection. You thought It was hard to hear the forest and your hunting buddies while wearing protection. It’s just didn’t make sense. But like so many things in life, technology solves ancient problems. Let’s take a look at why earplugs are so important for hunters. Hunters and farmers are two of the highest risk groups when it comes to hearing loss. But farmers and hunters are different. Farmers deal with the constant sound of farm equipment. All day they’re working around tractors, cherry-pickers, combines and more. This constant exposure to loud sound causes hearing loss over time. As a hunter, you may have an office job, be a teacher or work somewhere else where you’re not constantly being exposed to loud noise. You may feel safer than say a welder or factory worker. But some sounds are so loud that they can cause instant damage. You may experience a ringing in your ears after a hunt. That’s one way you’ll know that your hearing was damaged. If you go hunting every year or many times a year, you’re causing damage, little by little. As you age, this damage becomes more apparent. Any sound over 85 decibels (dB), the volume of someone yelling, can cause hearing damage over time. A single gunshot is 55% percent louder than that. It’s about 140 dB. It’s not a matter of if you’re damaging your hearing. It’s a matter of how young you’ll be when it becomes noticeable. A University of Wisconsin study found that hearing loss risk increased by 7% for every 5 years a person had been hunting. In real-world terms, that means if you’ve been hunting since you were 5, by the time you’re about 50, you a 50/50 chance of having disabling hearing loss. 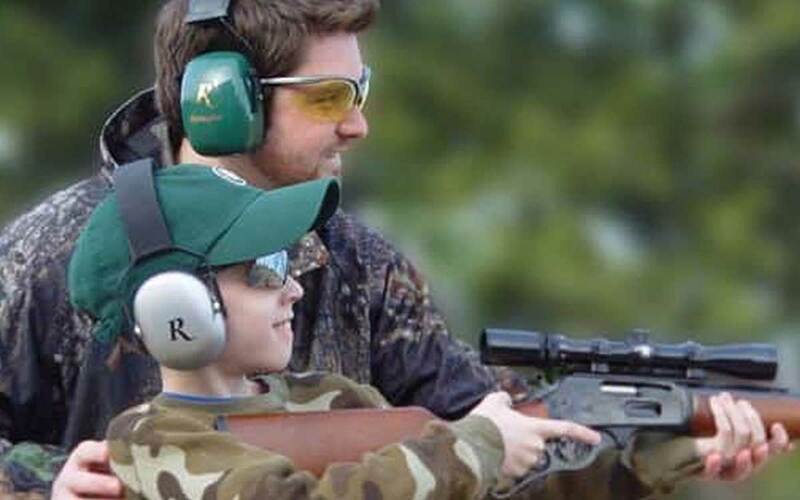 Alarmingly, 95% of hunters in the study said they didn’t wear hearing protection. Many hunters are worried about missing out on the hunting experience. But these days, you don’t have to. You can get custom earplugs that block loud sounds but still allow you to clearly hear conversation and the forest. These high-tech but easy-to-use devices fit into your ears. They remain on stand-by until a shot sounds. Then they immediately turn on, blocking the full volume of that shot. If you’re a traditional hunter who tries to keep the use of advanced technologies to a minimum, you can also use earmuffs and earplugs. These devices have different levels of protection, so you don’t have to block out all sound to protect your ears. People in loud factories and construction are often required to wear these. They’re a tried and true way to keep your hearing longer. Hearing protection will have an NRR (Noise Reduction Rating) that tells you how much protection you’re getting. Earplugs start as low as 22 NRR. With that protection a gunshot would still be damaging but not as damaging. It also means that you won’t be able to hear anything quieter than 22 dB. Don’t worry: a human whisper is 35 dB, so you’d still be able to hear your little granddaughter next to you whispering as she holds her rifle to her shoulder. Make sure she’s wearing earplugs too. Unfortunately, this type of hearing loss isn’t reversible. It can only be treated. And treat it you should. The longer you wait to treat hearing loss the faster it progresses. Today, the best way to treat hearing loss is with hearing aids. These high-tech, personalized devices learn about how you hear as you wear them. Over time, they learn how to help you hear best. If you aren’t hearing at your best, it’s time to get your hearing tested and find out where you stand.